Musical documentary follows an ailing Glen Campbell's farewell tour. Glen Campbell, renowned musician famous for time spent at the top of the country and pop charts on the back of such hits as Rhinestone Cowboy, embarked on a sullen "Goodbye Tour" with wife Kim at his side after sharing his diagnosis of Alzheimer's disease with the public in 2011. 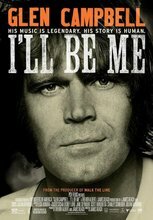 Glen Campbell: I'll Be Me is an emotional documentary examining Campbell's struggles with his mortality, bond with Kim, and the tour itself, which grew from a limited engagement into a long-running spectacle due to unprecedented demand.